We were struck with excitement when we found out that Title Fight will be playing to attic hall of Paradiso on their upcoming Spring tour with Dead End Path and Whirr. The renowned venue that’s based in the centre of Amsterdam fits this tour well, with its rich historic background. Paradiso is a converted, former church building that was squatted by hippies in 1967 who wanted to convert the church to an entertainment and leisure club. After iconic concerts from Joy Division, Bad Brains, Nirvana, and many others, it’s now up to Title Fight & co to steal the show. This is your chance to WIN 2×2 tickets for this event. Head down to our Facebook-page, find the above poster, TAG yourself in the picture and make sure to SHARE it on your wall to invite your friends. Go here to see the list of all shows Title Fight is playing in Europe this Spring. 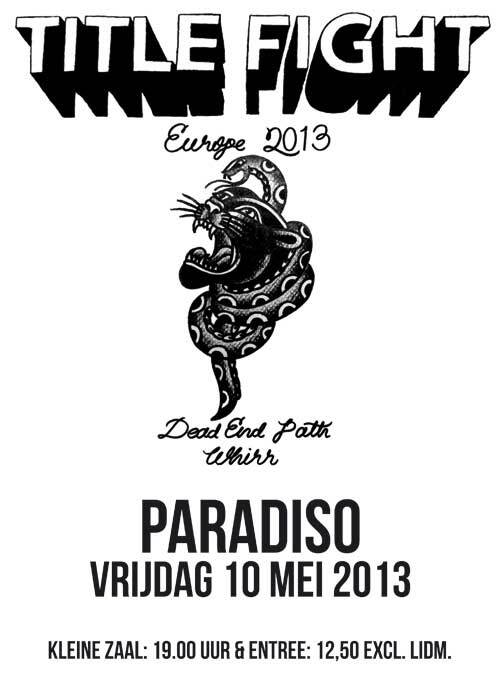 Tags: Amsterdam, Concert, Contest, Dead End Path, Europe, European Tour, Event, Facebook, Kaarten, Nederland, Netherlands, Paradiso, Poster, Show, Tickets, Title Fight, Tour, Wedstrijd, Whirr, Win, Winnen. Bookmark the permalink.